So I haven’t been posting in the last few months because what was supposed to be a part-time job turned into a full-time one just a few days after I started. It was a lot of information to take in and a major lifestyle change, and the stress of all that coupled with the long daily drive back and forth meant that I’ve had very little time or energy left for creating, let alone blogging. I am still here though, and while my posts will likely be sporadic in the next two months, they will get more regular once I go part-time in October. All that housekeeping out of the way, let’s look at what I’ve been making. Because I wasn’t exactly idle, as it turns out (to my own surprise). I have made a bunch of bracelets and experimented with fun techniques – I have yet to take pictures of them so those will come later. Also, I joined the summer 6-PAC and made a bunch of things: 5 tops, a dress, and a cardigan jacket. And two pieces I didn’t think to photograph, mostly because I’ve been wearing them to work a lot and they completely slipped my mind. 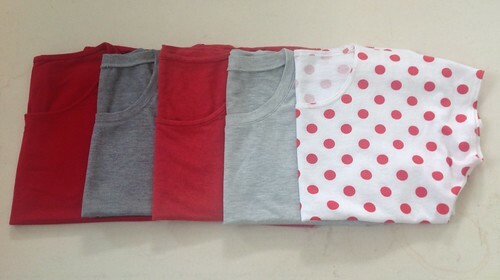 All of these tops are cut from Jalie 3352, the dolman top. The red ones in 11oz. rayon jersey from Emmaonesock have the original neckline without changes (I think). The light gray is a cotton knit from Nancy Erickson and has the most wonderful hand. The darker gray is a mostly-cotton jersey from Fabricmart – that one will be given away because it was doing some shrinking as I sewed it, and I only noticed it at the end. 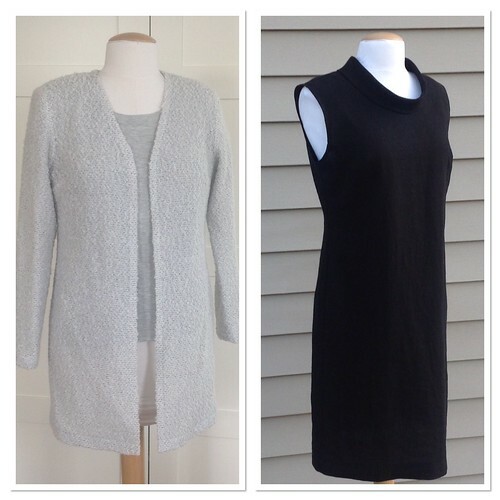 Both of these gray tops have a 3/4″ neckband, which was my attempt to see if I like the closer neckline (yes!) and if I like the neckband finish (not really). The cute polka dot is a cotton jersey from Marcy Tilton and it’s such a happy, smile-inducing fabric. For this top, I just closed up the neckline by the same 3/4″ and then clean-finished it by turning the allowance under and coverstitching. I like this neckline the best. Next time, I want to try a boat neckline to bring it up closer to the collar bone – I had accidentally put on one top the wrong way, with the back in front, and I liked the effect. The dress is drafted from Sure-Fit Designs Shirt Kit. I just lengthened it to dress length, took in the side seams some to accommodate the sleeveless design and the curve of my waist, and added the bias-cut collar. Oh, and the hemline goes in a slight A-line, which is comfortable, but I think I prefer a straighter silhouette. I made it in a lovely black Brussels Washer from Fabric.com – it is such a pleasure to sew and wear. Warning: it does seat out some so not your best bet for a formal anything. I cut the neckline fairly wide and the collar doesn’t play well with most of my cardigans but I do have a few RTW ones that work so the dress is not an orphan. The cardigan jacket is from my old PMB pattern (from 2002 or 2003, yikes!). I narrowed the shoulder slightly with a corresponding sleeve cap adjustment, curved the front neckline where it meets center front, and added 8″ to the length. There is no closure and the front edges meet but do not overlap. The fabric is an acrylic/wool/poly boucle bought from Fabricmart several years ago. It’s nicely warm, and super easy to sew. I enjoy wearing it and there’s more in the stash for another, shorter version. And that’s pretty much all I have right now. Thank you if you’re still reading, and see you soon! It’s a great idea. Really. I have been using Wild Ginger’s PatternMaster Boutique for years. I love it because it provides virtually unlimited options for combining style lines, necklines, collars, sleeve shapes and lengths, cuffs, pockets, hems, etc. However, it has a rather steep learning curve because the user must master both the software navigation and at least the basics of pattern-drafting. It is a true patternmaking software – you start with your own measurements, click radio buttons for various style options, enter your preferred amounts of ease at key points, and print your pattern. If you like to fiddle with your patterns and create new styles not available in the vast database of features, you can (before printing) take your pattern to the Pattern Editor, the other side of the drafting software, and transfer darts, create asymmetric designs, anything you want. Then you print. Some people dislike taping sheets of printer paper together but I have not found it to be particularly time-consuming. Now, the one thing that I’d like to see is a mannequin with my measurements who can wear my proposed garments so that I can evaluate the fit. Maybe one day. Meanwhile, Bernina came out with MyLabel. This fancy piece of software has that mannequin described above to help the user visualize the final result. You can even scan your fabrics in, or use the default choices, to see how you will look in the garment made from your fabric. There are sliders and buttons to help you adjust the color, transparency, sheen, scale, and other characteristics of your fabric so that what you see on the screen matches the piece in your stash. You can also drag various decorative stitches, embroidery designs, and buttons onto the pattern pieces and see them on the mannequin. Position and reposition; change colors, widths, and sizes; play to your heart’s content. When you think you’re done but would like someone else’s opinion, you can save the mannequin in her outfit as a .jpeg file and share it in an email. Pretty cool, huh? I actually think this particular feature would be great for planning a SWAP (Sewing With A Plan) storyboard. And when you’ve made your decisions, you can print your pattern either on your home printer, or at the nearest Kinko’s (or equivalent). Now, the catch with this software is that there are only 20 patterns included in it, with very limited options for making changes. That makes MyLabel a pattern-fitting software. Not that it’s a bad deal by any stretch of imagination – just take a look at how much professionals charge for fitting and altering a pattern, multiply by 20 and you’ll get a figure far beyond the cost of the software. These 20 patterns, or your favorite choices among them, become your basic tried-and-true patterns. You can then superimpose details from other patterns on your basics, and sew up a wardrobe full of beautiful garments that fit perfectly and look just the way you intended. I would like these two pieces of software to be integrated but coming from two different companies, this is not likely. So, I’ll do the next best thing. Get my basics from MyLabel, plan all embellishments and color combinations for a coordinated capsule in MyLabel, then grab some of the myriad of lovely details available in PatternMaster Boutique, and morph them onto the basic patterns. The best of both worlds.